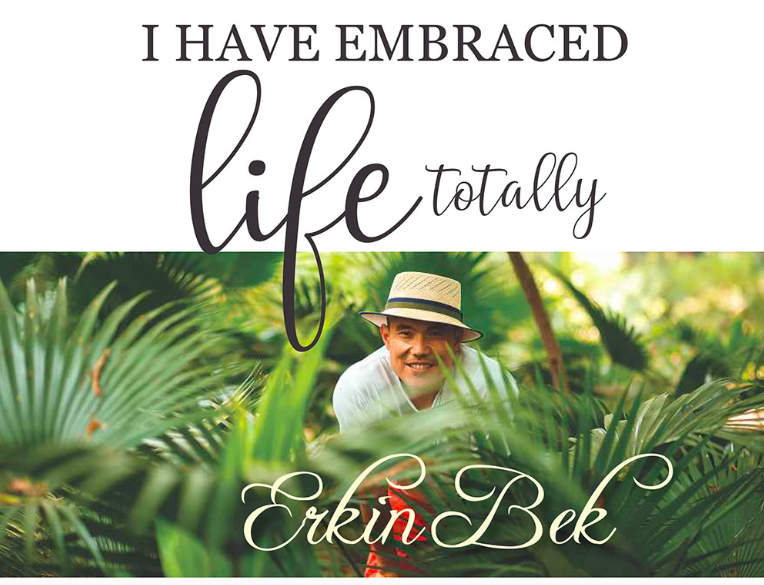 Erkin Bek is the author of his vision and the book ”All Here”. He talks to Shruti Prabhakar from Ayurved Sutra magazine about his vision. He was a successful entrepreneur in the initial years of his career. Later he stepped on the inner path towards self-fulfillment, which culminated in an unprecedented achievement of liberation and inner fulfilment in recent years. He is a dedicated proponent of Raja Yoga and a widely liberal lifestyle. From the Himalayas to Delhi, where he’s a frequent resident, he travels the world and gently promotes a healthy and enlightened approach to life. What is your book ‘All Here’ about? All Here … All Here! Not there! Not tomorrow! All here is a sensation that you have arrived. Everything for you now is right here! Everything has happened to you. In this very moment, when All is here, for you – you are great! I am great! Everyone is great. There is no better ‘over there’, or better other person or better something else. All is right here. It is like you have found a home inside you. And wherever you go, you bring your inner home. Then you feel at home everywhere. It’s something very simple, you achieve inner comfort. This inner comfort is everything, and you go with this, you move, with your being comfortable with oneself. This is great because you are comfortable all the time. All is here. You are the best, I am the best, everyone is. Is the author of ‘All Here’ a seeker too? “All here “is the arrival. All Here – It’s like climbing a mountain, finally you have arrived, finally, you are at the top of the mountain. Before it was seeking, finding the path to the summit. Now you have arrived, now you are at home, there is no need to seek any more, I have found it, and I have found it right here (Erkin lands his hand down on his chest). All is here for me. In one of your poems, you have written that there is ‘No spirituality, consciousness, the spirit in separate existence’. Can you define the word ‘Separate’ here? I vouch for clarity of consciousness. When you have become clear, then everything comes together. For thousands of years, people are referring to the soul, spirit, god, angels, so on and so forth. So which one is the one to pick? Which one is the most important, the soul, the spirit and what is it exactly, each one of them and where are they? When your consciousness is clear, everything becomes one, you have the clarity of life. There is no separate soul over there, spirit somewhere else. In the clarity of consciousness, there is only this presence, the presence of clear consciousness. This is oneness. This is everything, there is no separation. Spirituality comes from the root word spirit. This is why no spirituality implies there is no spirit. There is only clear consciousness. Before humans existed, there were no spirits, there was however universal consciousness. One universal consciousness – this is it. What path should one follow to achieve fulfilment? Have you achieved it? Can you please talk about your journey? Arriving in “All Here” is arriving in fulfilment. It is like filling in the empty glass. This is the inner glass I am referring to. The glass has become full. All is here. Now you can surely understand and appreciate this concept of arrival in this very “All Here” condition, in this presence. You may perceive the idea but how do you actually get there, how do you arrive in this, to fill in the inner emptiness? There are 7 billion plus people on earth, there are 7 plus billion journeys because for every person it is a unique path. One is embracing life in all it has to offer, not escaping somewhere to seek enlightenment but to go for everything. Because if you want to have everything – You have to live everything! Secondly, I have stepped on the intellectual journey of Yoga, it is the path called Raja Yoga. Raja Yoga is the ultimate steps beyond physical postures, beyond breathing practices, beyond chanting, even beyond sitting like a statue in meditation. All of that is not sufficient. They prepare you but the final is the intellectual keys to reach for the highest. This is what Raja Yoga is about, the know – how. I have embraced Raja yoga and I have embraced life totally. It is very important to embrace life totally because if you run away, you are seeking something but to arrive: in yourself, to achieve manifestation, to manifest as who you are, at some point the seeking will have to be dropped. This is why at some point one will have to leave the monastery, one will have to leave the ashram, one will have to leave all these ascetic venues, avenues, because to be yourself, to arrive in yourself, the search has to come to an end. At some point you come to your essence and when you arrive, all of that seeking has to subside, has to become silent. So to summarize, embrace everything, live freely and step on the path towards self –fulfillment. My such path has been Raja Yoga. You are a follower of Raja Yoga. As a seeker how will you define Raja Yoga and the effect it had on you? Raja yoga is also known as royal yoga. It is royal yoga for a reason. It is not for everyone. You have so many styles of yoga. This yoga, that yoga and there are so many good ones actually. But the Raja Yoga , the king yoga is for the one who has done all these other yogas, who has done so many yoga postures, who has done so many breathing practices, who has been seating in concentration, doing a lot of things,chanting,going to the moon, to the mountain, going to ashrams, trying different styles. The Raja Yoga has nothing to do with all those things. Raja Yoga is the path of consciousness. It is the path after you have completed all those things. Not everyone is ready to go beyond all these fancy practices. All of that is important as a preparation towards the final, the royal journey. You have to prepare to become the king. Not everyone is ready. This is why it is called Raja Yoga. Raja Yoga is mainly defined in the yoga sutras of Patanjali. It is described very simply in very few sentences what is yoga. The very first definition: “yogachittavrittinirodha (Erkin exclaims in Sanskrit) –Yogacessation offluctuations of consciousness (he translates)”. Yoga is a cessation of fluctuations of consciousness (Erkin repeats)! Then the Seer abides in essence! In other words, when the fluctuations of consciousness have become silent, your thoughts, your emotions, your bodily activities have all become silent- you have reached your centre. You have reached your essence. This is yoga! Not sitting in a posture, not doing some breathing exercise. Yoga Chitta vritti nirodha! Cessation of fluctuations of consciousness! When consciousness is fluctuating then the person identifies with these fluctuations of consciousness. “Vrittisvarupiamitaratra”(Erkin recites in Sanskrit again, then exclaims a translation)- “At other times there is identification with fluctuations.”. But yoga is not identifying with your running ideas. There is no more running ideas, movements of your consciousness. All of that has come to tranquillity. This is yoga. This is Raja Yoga. To arrive in this, how to come here is the path of Royal Yoga. Can you tell us how you met Dr Rajesh Singh and what influence he had on you? I have met Rajesh on a holiday at a yoga class. I was just practising the physical practices of yoga, which you can refer to as hatha yoga, practice like postures. I’ve been roaming around yoga schools in North America. When I arrived at his class, he had a peculiar style of presenting the practices of asanas and he is a completely unstructured guy. His feet were not necessarily straight. He would often take breaks. He would not be in these perfectly looking alignments. A bit too relaxed. When I looked at that, I said to myself ”What is this? This guy is too relaxed.” This is not how yoga should be. But I gave him the benefit of doubt and continued to follow. But at some point, this style of easy approach and less tension, very relaxed, turned out to be something pretty relaxing, pretty nice experience. So I Just liked the first class and I went after the class to talk to him to see what is this all about. Because by the end of the class I was totally convinced this was something very different and very nice. When I have approached him, what is yoga actually about? He gave me one very interesting answer that nobody else ever said since and it is something that I myself absolutely aspire to and now with the experience, I can firmly endorse this statement that he has pronounced back then. He recommended that I look at the book “Yoga Sutras of Patanjali “describing the journey of yoga. And he said “if you read this book you will never need to read any other book. This is the only book you will ever have to read.” So I asked him “What is this book, where do I find it?” And the book was available at the place where I stayed. So I picked the book and I asked him for another session just to talk about yoga, liberation, enlightenment. And we had two private classes, perhaps three, where he has introduced me to the ideas of where yoga should actually take you, introduced me to some further practices, described some of the intellectual aspects of yoga. We took quite a lot of time to go through that. There was a lot of discussions, which I very much valued. I have left my vacation but after some time I have contacted him and have requested to follow up. Ever since we have been in touch. I have for years followed his guidance and introduction to Raja Yoga. Then I travelled across India to visit various yoga schools, to meet different teachers. And by visiting so many different places, I have discovered that even to learn yoga in India is not so simple. It’s like a bazaar. There is a lot of information; a lot of people and just like in any other field, there is a lot of confusion. So we kept interacting and I got deeply into the studies of Yoga Sutras of Patanjali. And Rajesh was there to advise. I did not ever expect that I would be able to climb to the top of the mountain. This was an unprecedented journey and I thank my yoga teacher and my friend, who is now my good friend Rajesh for that. Yoga and Meditation have been receiving its due attention. But the understanding of yoga has been limited to merely its physical context while so called spiritual activities can be seen taking place in the name of meditation. Your comments? I have described earlier about the definition of yoga and its ultimate destiny. Physical practices, they are there, important to begin, a lot of people understand this. This is where you start. Then comes the notion of spirituality and this is where the problem, a very big problem begins- the hype of spirituality! Because with spiritually come all the ideas of spirits, gods, some sorts of things “over there”, somebody, something is always great somewhere there, some sort of spirit, some sort of energy, some substance. Most of it is hush hush, this spirituality! This smoke of spirituality should be completely blown away because the smoke is creating a veil to see yourself clearly. And to see yourself clearly it is not about spirituality. Yoga is defined very clearly. Yoga is cessation of fluctuations of consciousness!